This week at 4:00 am monday morning a New Zealand tourist at Kata beach, Phuket saw his bank card swallowed by an ATM machine after he entered a wrong PIN code for the third time. He had to check out from his hotel and catch his flight, but he was left without the money he needed. In a rage outburst he grabbed a rock and started hammering on the machine. After he was questioned, the police brought him to the bank manager. He agreed to pay for the damage amounting 22,000 Baht (700 USD) , after which reportedly his card was returned. The story doesn’t tell that probably he would need his bank card to pay for the damage in the first place and also that local bankmanagers would never be able t0 help one out with any foreign ATM card. Most likely the New Zealander had a card from Thai bank, since foreign cards will never be swallowed, just the code on the magnetic stripe and CP-8 chip will be invalidated. Most likely the bank issued a complete new card, which was quite a kind gesture towards a potentially violent customer. Personally I’m very bad in remembering numbers which besides paying or getting money are otherwise completely insignificant. Due to circumstances which I will not bore you with, in Thailand my bankcard has been deactivated once due to entering a wrong PIN number and one time when I forgot to take the card back from the machine, so it was swallowed or stolen before I got back. To have your bank or credit card invalidated is a big hassle, especially when being abroad. Where it concerns PIN codes and ATM’s, I developed some special techniques which I will share with you. In European countries many banks will require you to validate a new card in one of their own ATM’s before it can be active, so you will need very close friends or family who will after receiving your new PIN code, validate it and send you the card to your foreign address. The only other alternative is to fly back home. In stead of passwords most European banks will now require your bank card and a small card reader, which will issue specific security codes for login in or for transferring money. In case of loss or deactivation, you’re more or less left alone in the dark. If you travel a lot or are living abroad, it’s best to keep a second card in a safe place. I will refrain from more well-intentioned advise like keeping all your cards in a safe place all the time etc. Do you have a bad memory for numbers? If it concerns numbers, some people have a memory like a shift register. ie. every time you will learn a new number, you will forget the old one and at times you will even have problems with the last one you learned. Surley, the older you get the more difficult it will be. Older people or people in general prefer to have one code for all their cards, but this seems not always to be feasable. If you feel confident enough, one way is to send yourself a mail with the various PIN codes and a one character abbreviation of your bank, never store any online passwords though. The changes that outsiders are able hack into your mail and also would have acces to your card is minimal. However if you’re not 100% sure about everybody who get’s into your house, find another way or try it my way. The key to my technique is visualizing patterns instead of remembering plain numbers. Even if you forget the exact code, the pattern will still be there in your long term memory. The trick is to use a numeric keyboard which resembles an ATM keypad. A calculator will not do, since it has the sequence of the digits reversed. Any (old) cell phone or a real ATM keyboard will work, otherwise just draw it out. In the first example; 1537, try to visualize starting in the top-left hand corner, move to the center then to the top-right hand corner to finish in the bottom left. The pattern is may remind you of the letter y. In the second example 8793, start in the center, go to the left, continue to the right which are all at the bottom, finish it by moving to the top-right corner. The pattern may remind you of a handwritten letter v shape tilted to the left. In the beginning just remember and exercize the pattern, not the digits. You’re using a complete different kind of memory now, after a few times your graphical memory might be connected with your long term memory. This method may help you to remember up to two or three PIN codes. Unlike in most Western countries, especially in Asia, many ATM machines will require you to take the money first after which a printed receipt is issued. This might confuse you and make you forget that your card is still in the machine. Especially if you are distracted or just thinking about different things, this can become very tricky. When I came to Thailand in 2009, an older German told me he never used ATM’s, since he claimed they were not working properly and often didn’t give your card back, so each time he went to his bank showed his ID and took his money. Besides the fact that your bank might not have a branch overseas, his story is of course not corrrect. 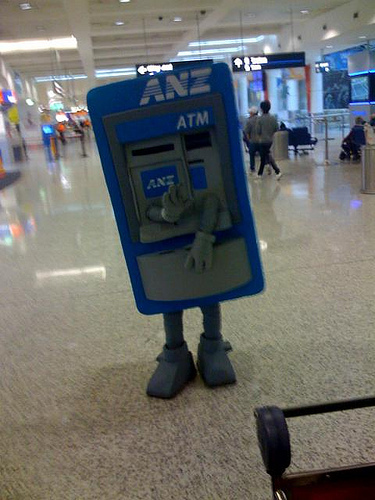 ATM’s are just machines, but you have to follow the right procedure. My small trick here is to hold the up the hand which you don’t use with your thumb and your index finger put together, more or less like you you’re making an upside down OK sign or in other words like you expect something back, ie. your card. If you leave and you’re still left with your hand this way, this will remind you to take out your card. If you’re keeping a wallet in your hand, the method will be less effective, since you might simply close the wallet with the money and leave without your card. It’s better to take the money and receipt in one hand while waiting for your card and then put all back where ever you normally keep it.